The Storm over Paris by William Ian Grubman is a historical fiction novel taking place in Paris, 1942, and follows an art dealer trying to save art from the hands of the Nazis. This is Mr. Grubman’s first novel. Hagar is a biblical figure from the book of Genesis, a domestic servant to Abraham and Sarah. Since Sarah could not have children, she offered her servant to her husband. Soon Hagar became pregnant, and the jealous Sarah threw her out of the house. Alone in the dessert an angel found Hagar and blessed her child, naming his Ishmael (“G-d Hears”). 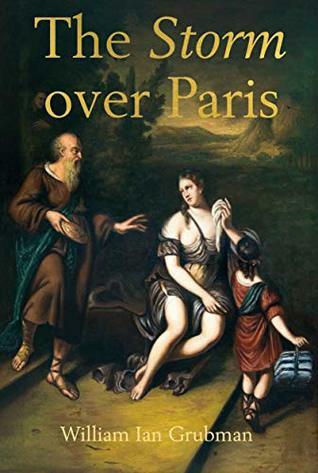 The Storm over Paris by William Ian Grubman could be looked it as a allegory to someone being thrown out of the a comfortable home, being lost (at least emotionally), and then finding some redemption in an impossible situation. That might be a stretch though. I did enjoy the book, it was easy to read, a small cast of characters, and an interesting story. I always enjoy historical fiction where actual historical figures make an appearance and interact. I also appreciated the technical descriptions of aging a painting to fool the eye (even though probably not an expert). We live in a wonderful age, with the knowledge of the whole world at our fingertips and I often like to supplement my reading with Internet searches. Sometimes it is just to look up more information, see what a person might look like, or a piece of art the author is trying to describe. I thought it was strange that the author picked a fictional painting, The Expulsion of Hagar by Michelangelo Merisi da Caravaggio, it’s not as if this subject hasn’t been painted many times, and there are a plethora of paintings to choose from. I just assume this is a stylistic choice, there is nothing wrong with it, but as I said, I find it strange. Mori Rothstein, a Parisian art deal and expert in paintings of master artists is coerced by Reichsmarschall Hermann Göring into choosing and cataloging paintings which will be sent to Germany. Mori agrees to “help”, under fear of deportation and to protect his family. With the help of his sons, few chosen friends, and wife, Mori sets out to create copies of masterpieces to be sent to Germany, while keeping the originals in a safe place.